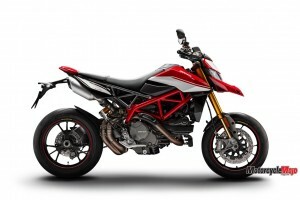 Ducati’s newest plaything is sure to liberate your inhibitions. 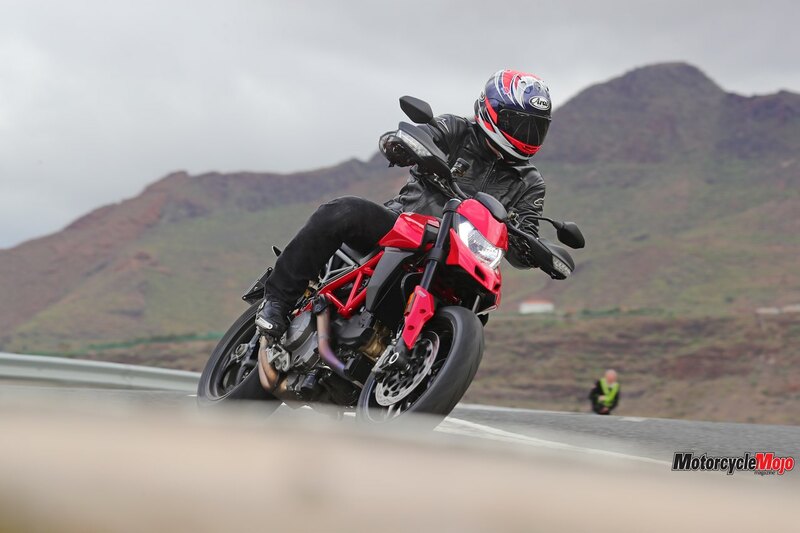 The town of Maspalomas on Gran Canaria in the Canary Islands has a one-two punch to sweep any motorcyclist off his or her feet – a small but very entertaining race circuit right next to the ocean, and some of the most amazing mountain roads imaginable just a few kilometres inland. 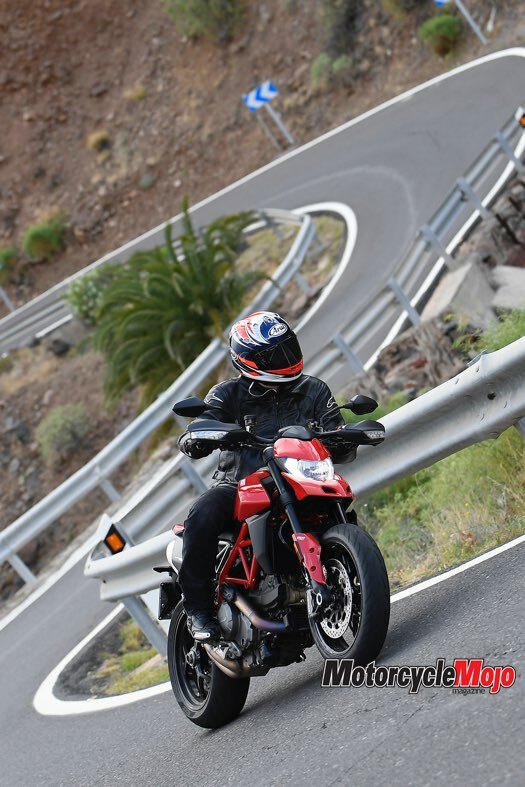 What better place for the worldwide launch of Ducati’s new-for-2019 Hypermotard 950 and Hypermotard 950SP? 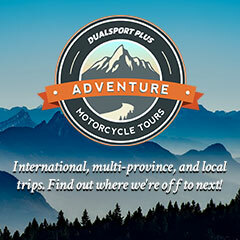 The cost of entry for the bike is $15,295 ($18,795 for the SP) – getting to Maspalomas is all on you. 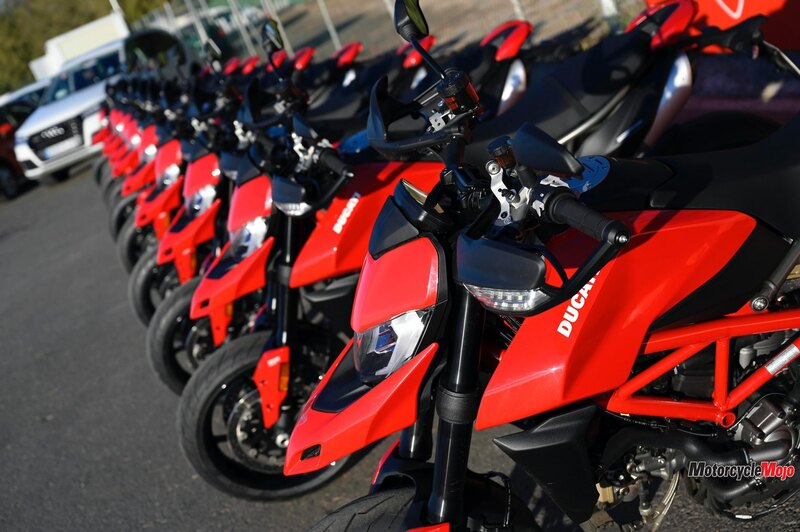 Ducati bills these bikes as being made for hooligans, but I might counter that the bikes are even better at turning riders into hooligans, as much as they cater to existing rabblerousers. 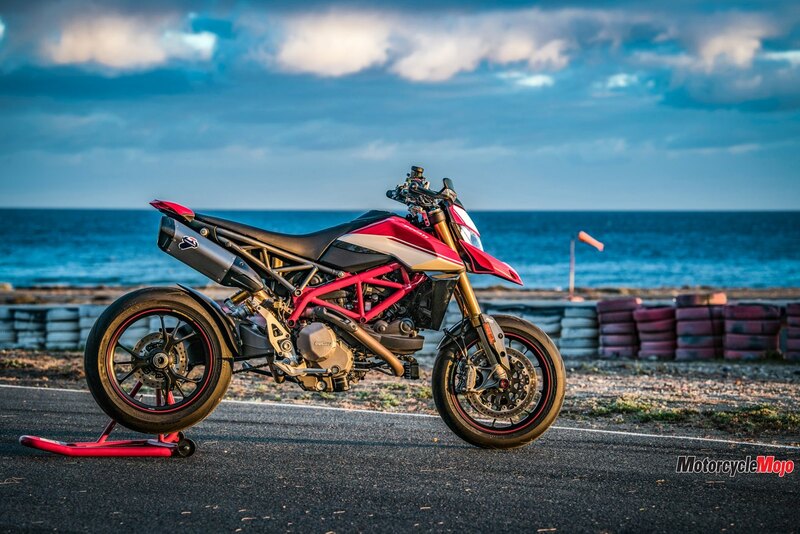 Ever since someone had the bright idea to bolt road-race rolling stock onto a dirtbike chassis, showboating wheelies and lurid slides have been the trademark of the Supermoto/Supermotard genre. 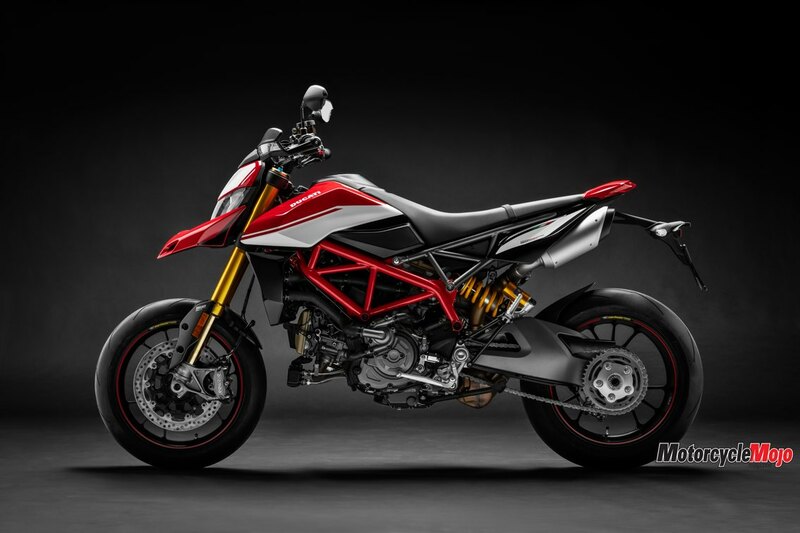 The new Hypermotard twins deliver the performance and technology to make such shenanigans accessible to mere mortals, while still allowing the Rubén Xauses of the world to punch holes in the laws of physics. 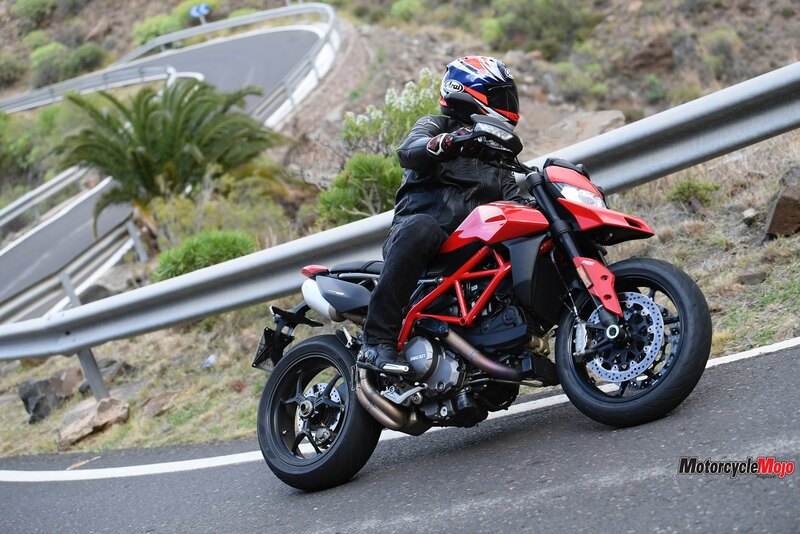 The magical formula for these mythical beasts starts with Ducati’s signature trellis frame, L-twin motor and Desmodromic valve actuation, so no surprises there. 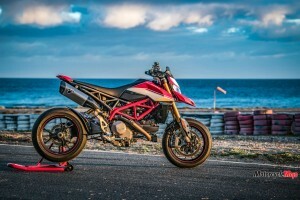 These elements, however, have been reworked from the previous-generation Hypermotard to produce a machine that is four to 6 kg lighter and 4 hp stronger. 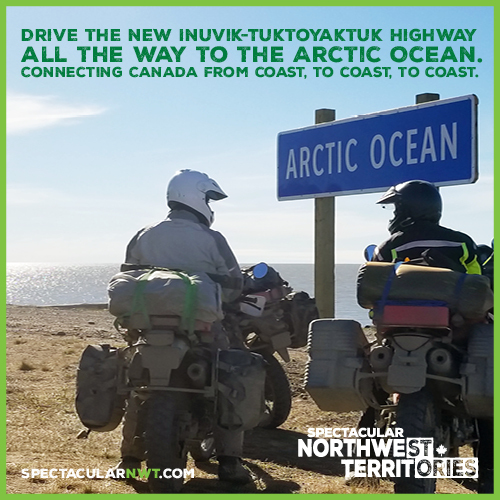 New pistons with a higher compression ratio, a new exhaust cam and a new 53 mm throttle body combine with new engine mapping to produce the power increase along with a healthy torque plateau between 5,000 and 9,500 rpm. The Testastretta 11° engine (indicating an 11-degree included valve angle) is liquid cooled, and displaces 937 cc, just like the previous Hypermotard, despite the new bike’s 950 designation. 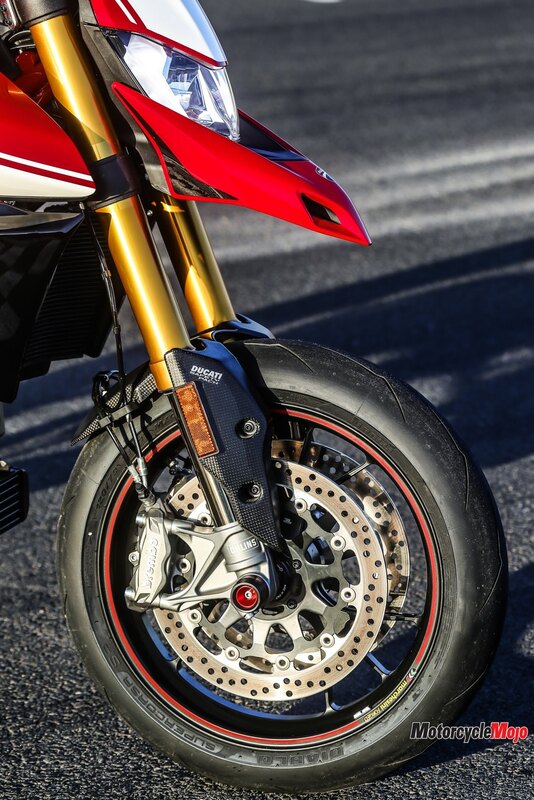 Reducing the steel tube wall thickness in strategic areas on the frame, magnesium cylinder head covers, and some aluminum bits in the suspension and brakes all contribute to the weight savings for the base Hypermotard, while carbon timing-belt covers, front mud guard and forged Marchesini wheels help shave a further 2 kg from the SP model. 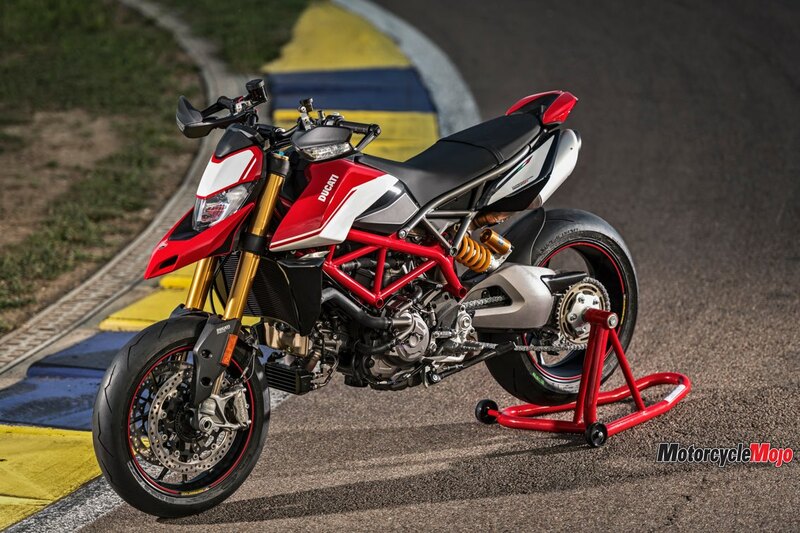 The engines and frames of the two versions are identical, but for your extra hard-earned dollars, the SP comes with fully adjustable Öhlins suspension front and rear with increased travel, an excellent quick shifter (optional on the base Hypermotard), the aforementioned Marchesini wheels and carbon bits, and Pirelli Diablo Supercorsa SP V3 tires instead of the base 950’s Diablo Rosso IIIs. The increased travel of the suspension allows for three degrees more lean angle compared to the base 950, but does raise the seat height 20 mm (more on seat heights later). The Circuito de Maspalomas is laid out next to an airport that is seemingly right on the beach, with some track configurations incorporating the airport tarmac and runway. There is a small elevation change as you approach the end of the front straight and exit the first set of corners, but the rest of the circuit is pancake flat. The configuration we used consisted of four second-gear hairpins and two chicanes, all joined by short straights. It was a perfect playground for the more track-focused SP, allowing for tail-sliding corner entries, surprising lean angles and power wheelie exits. My first sighting lap, however, was a slightly jerky affair as I adjusted to the sharp throttle response metering out that meaty mid-range when in Sport mode. A slight brain-to-throttle-hand re-calibration and things smoothed out by lap two, and by the first flying lap, things were dialed in. 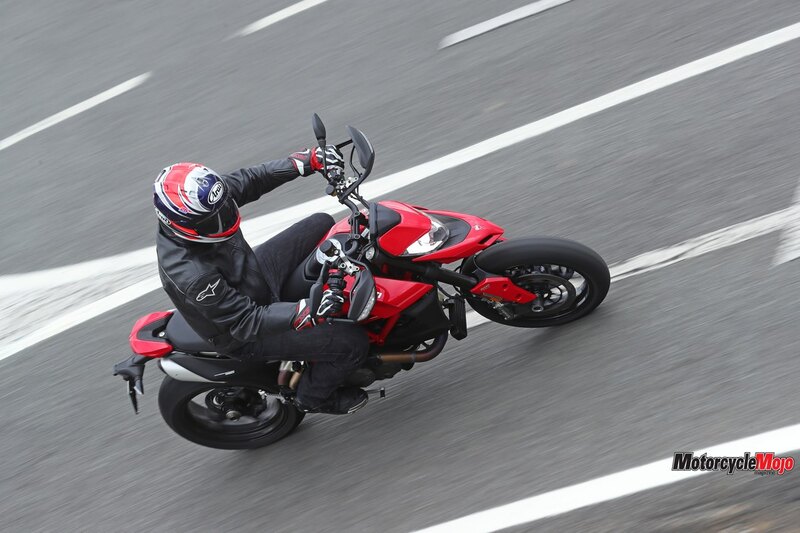 The torque curve is flat and broad, with no dramatic steps, and power wheelies were a firm twist of the wrist away in any of the four second-gear corner exits. 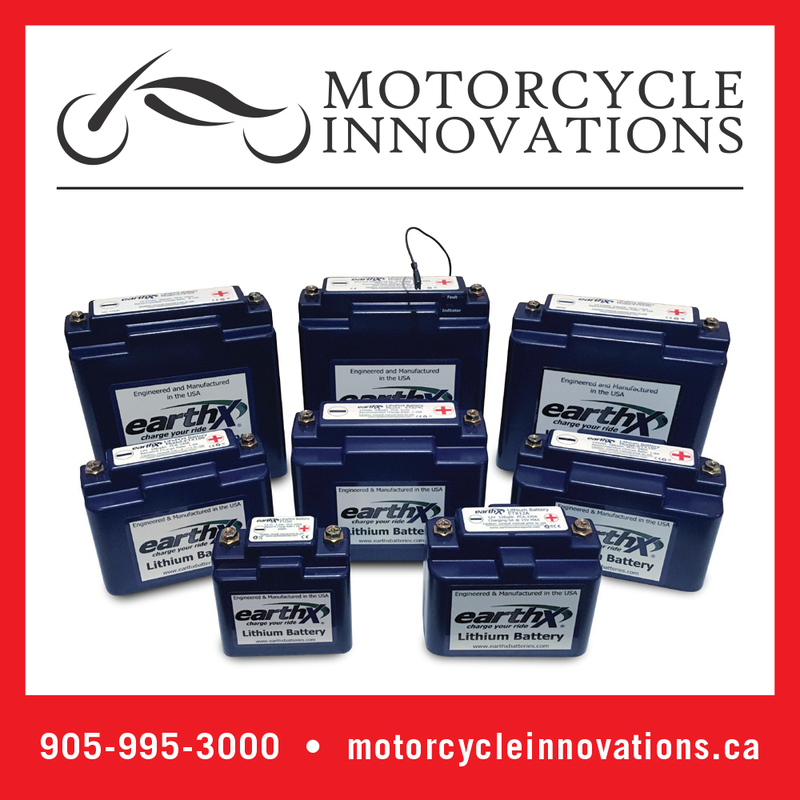 The electronics package consists of a Bosch six-axis IMU (inertial measure-ment unit) controlling cornering ABS, Ducati traction-control EVO, wheelie-control EVO, and Ducati Quick Shift, with varying degrees of customizability via the left handlebar switchgear. 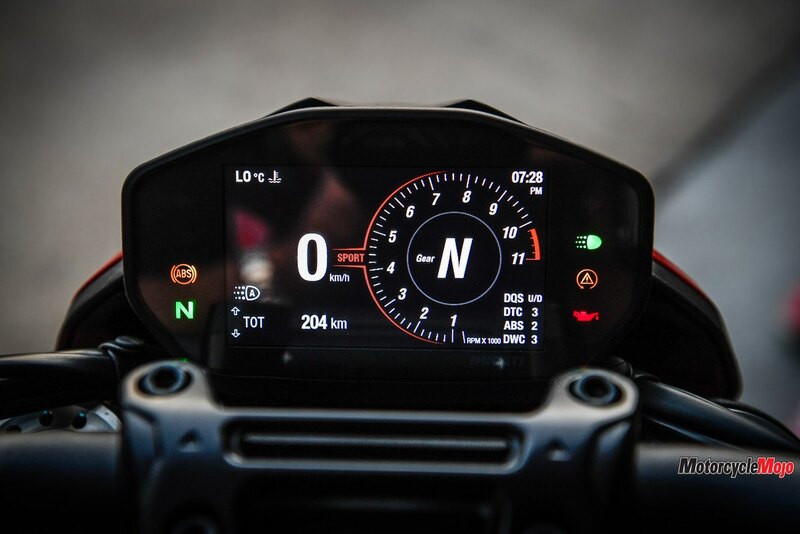 Sport, Touring, Urban and a track mode are available. 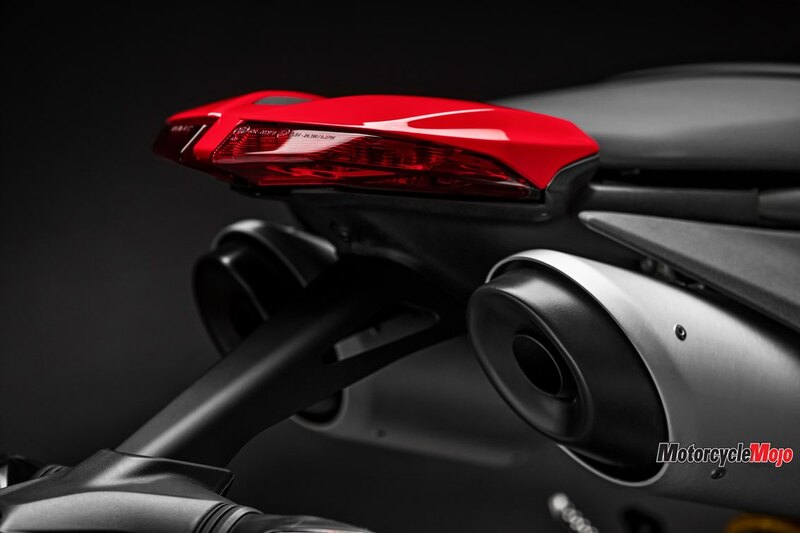 The lowest level of ABS intervention (it can’t be completely turned off) activates Ducati Slide by Brake, which allows for a degree of rear-wheel sliding mid-corner using the rear brake. 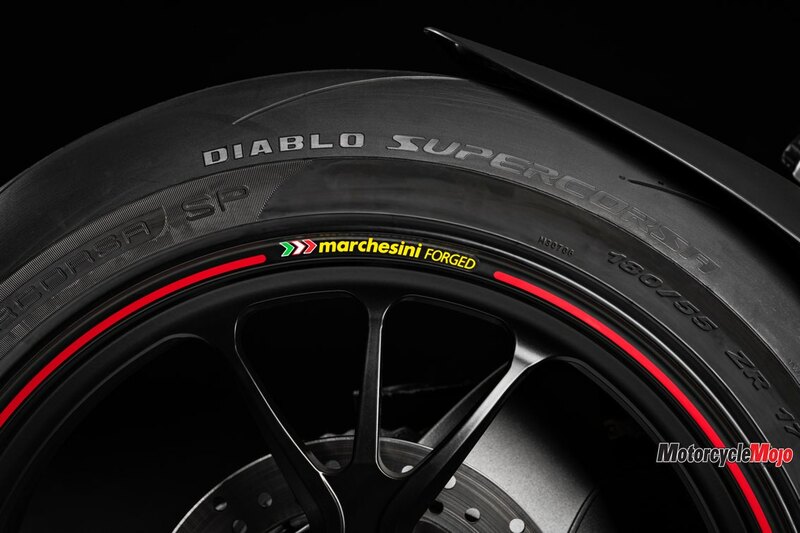 The Diablo Supercorsa SP V3 tires warmed up quickly and provided fantastic grip and stability. 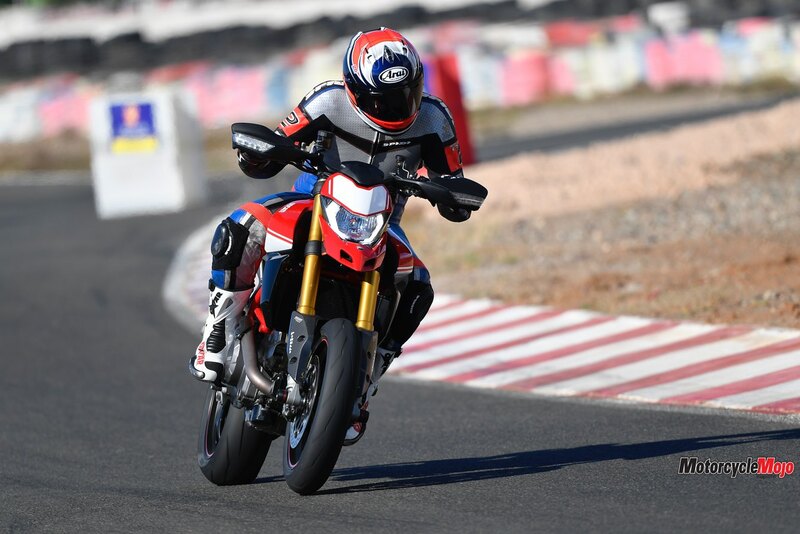 The bike is tall, as supermotos are, but the bike tipped in smoothly and predictably, and tackled the quick left-right transition of the first chicane with athletic ease, although the suspension wallowed very slightly here. With a little more time, I might have asked for some adjustments to the Öhlins to suit my weight and help prevent that wallow, but out of the box, the setup was already quite close. 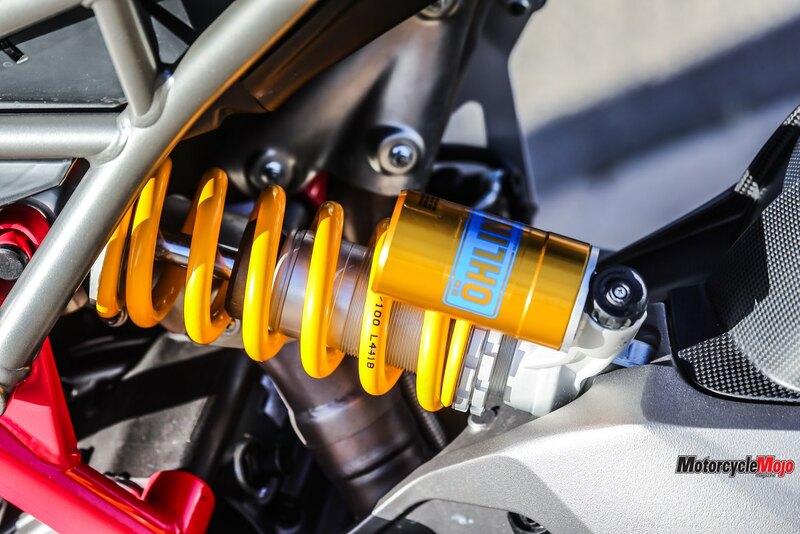 The SP’s quick shifter is a must for serious track duty, taking the clutch and throttle modulation out of the equation when hustling in and out of corners. 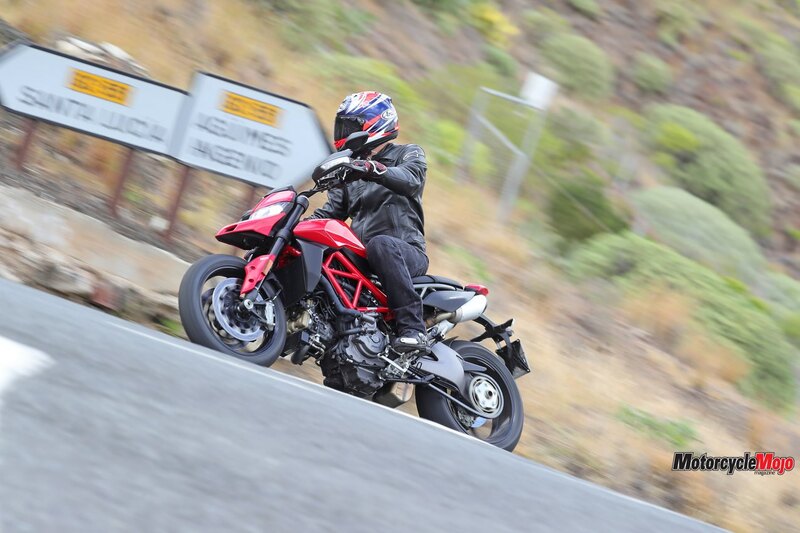 The Ducati’s gearbox was smooth and crisp, although I did encounter a false neutral or two over three sessions on the track. These can likely be chalked up to low-mileage gearboxes and me not being quite firm enough on the shifter on occasion. A slight adjustment to the shift lever to better suit my foot position may have helped as well. Otherwise, the shifting and gearing were spot on. The Brembo brakes were certainly powerful, but I did find them just a tad mushy for feel. 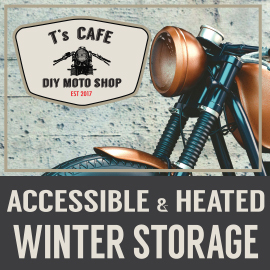 Speaking to a few of the other journalists, I learned some had the same feeling, while others did not, so it may have been a nuance between bikes, or possibly a tiny bit of air in my tester’s brake lines. In comparison, I found the rear brake slightly on the touchy side, but these are very minor nitpicks for a brake setup that is quite good overall. By the end of the track sessions, I was struck by how effortless it was to ride this bike at a decent pace and start getting loose and lofty. 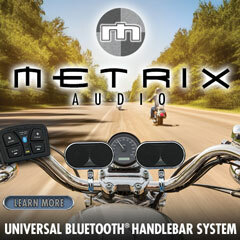 It is an extremely capable bike that takes the complication out of the equation using advanced technology. 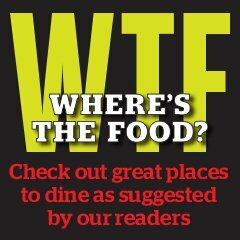 It almost feels like cheating.